LAWRENCEVILLE, Ga. – When a family created a place for their son to learn and work, they had no idea it would turn into a community-wide treasure. Tempa and Michael Kohler opened ‘Special Kneads and Treats, Inc.’ so their son Bradley could have a place to work after he turned 22 and aged out of county-supported programs. He has Fragile X Syndrome: a genetic condition that causes learning disabilities and cognitive impairment. Both parents say Bradley inspired their business plan. ‘Special Kneads and Treats, Inc.’ hires people like Bradley, who may otherwise find it difficult to get a job. “We knew early on that we were going to have to find a job for Bradley. And we just thought, well, why not open a bakery?” says Tempa Kohler, Bradley’s mom. Tempa has been baking and decorating cakes since she was 13 years old. “I just turned 50 so I have a little experience there,” Tempa says with a chuckle. A non-profit bakery wasn’t exactly what Tempa and Michael’s life plan looked like at first. “I traded my Harley for a minivan with cupcakes on it because God will make you do some strange things,” says Michael Kohler, Bradley’s dad. Michael worked in the corporate world for almost 30 years and says he lived a very different lifestyle. But after this experience, he now describes himself as a big softie. 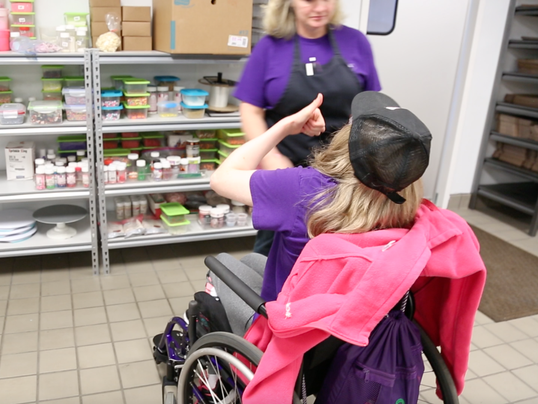 They not only have made it their mission to employ kids and adults with disabilities, but through these opportunities, a ripple effect is felt throughout the community. For instance, both of Charisse Southerland’s children, Cody and Courtney, work at the bakery. She says since they started, Cody’s language and ability to work with others has blossomed. “They have their own life now. Cody actually has his own purpose and his own life,” says Southerland. “For me, it means an opportunity,” says Courtney Southerland, Cody’s sister. There are countless examples of people whose lives have transformed because of the bakery. Scotty, for example, at the age of 52, got his first ever paycheck. Stories like these are what have driven their success since the grand opening in 2014. “In just under four years, we’ve just exploded,” says Michael. The new location is complete with all the necessary adjustments. “We have six tables that are hand cranked, and they go up and down to the wheelchair or walker level as needed,” says Tempa. 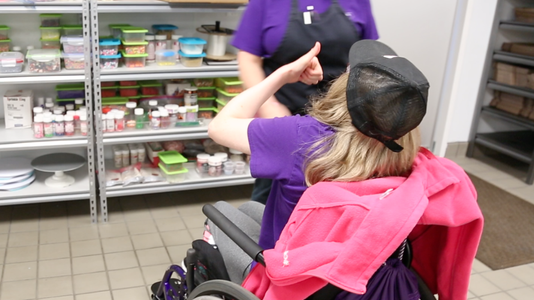 This bakery is a labor of love for the Kohler’s, as it is a nonprofit and 100% built for those with special needs. The Kohler family also works with 18 different agencies around Gwinnett County to provide free birthday cakes to kids whose families aren’t able to afford one. They hope their story is one of inspiration for other business owners. “There is an entire sect of special needs people who want to work who want to make a difference,” says Michael. Though what comes out of the kitchen at ‘Special Kneads and Treats, Inc.’ is supremely sweet — their heart and sense of faith is even sweeter.